It’s the best Star Wars movie in 35 years. It’s also acknowledged it might be a fruitless endeavor to be spoiler-free here; the last time a movie was able to successfully keep a surprise beyond opening day was probably The Sixth Sense — another Disney release by way of Hollywood Pictures — back in 1999. In this age of social media, being able to keep secrets even before opening day is pretty impressive. But one thing will be said. Among all those rumors floating around, there was one about why Luke’s not in the poster and in the trailer. What seemed to be the worst kept secret in the history of all storytelling has turned out to be wrong — idle fan speculation at its finest that managed to permeate conversations and chatter around the globe, including corporate sustainability meetings and radio traffic reports. The real thing is even better. One can only wish screen scribes J.J. Abrams, fresh off the Star Trek reboot, and Lawrence Kasdan, returning to this galaxy far, far away for the first time since Return of the Jedi in 1983, had been brought onboard for Episodes I-III. Jaded viewers might comment on how this episode at times seems to be a “greatest hits” collection from Episodes IV-VI. There’s a new Tatooine, a new Hoth, a new Endor, a new Yavin. Different names are used, but some of the environments feel familiar. There’s also a thrilling ride on the Falcon through a crashed Star Destroyer, reminiscent of the Death Star assault in Jedi and the asteroid field scene in Empire. There’s also a new cantina. Actually, it feels more like a pub, so that doesn’t count. A pub with live reggae. Fine. But this movie’s focus is on several solid new characters in the Star Wars universe; solid new characters were completely absent in the prequel trilogy. 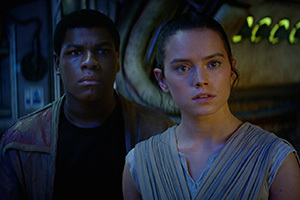 The new crew includes Rey (relative newcomer Daisy Ridley), a scavenger on desert planet Jakku; Poe Dameron (Oscar Isaac, Sucker Punch), a pragmatic Resistance fighter; and Finn (John Boyega, Attack the Block), who’s abandoned a cause that conflicts with his conscience. As for the returning characters, they show their age. This movie doesn’t ignore the passage of time. 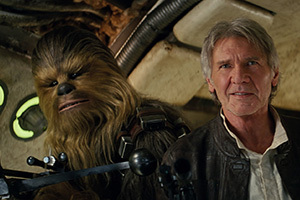 Han Solo (Harrison Ford, a legend in his own right) in particular gets a new depth, the kind that no doubt pleases Ford, who quite openly chided Han’s lack of depth following the release of Return of the Jedi. And this one also shifts the focus away from the world of digital (at least for portions) and goes back to on-location filming in places like Ireland and United Arab Emirates. “Filming” indeed. Spurning George Lucas’ digital revolution, this was shot on good ol’ Kodak film, in 65 mm and 35 mm, participating in a tactile resurgence also pursued by Steven Spielberg, Quentin Tarantino and others, along with that upswing in vinyl music sales. What was old is cool again. And that includes the Millennium Falcon’s chess board and old-school targeting system. Yeah. It’s good to be a Jedi. Here’s the deal. In The Force Awakens, lots of risks are taken with characters old and new. This is a big-budget gamble and it pays off handsomely for Abrams and Disney. The House that Mickey built should recoup its roughly $4.5 billion purchase of the franchise in pretty short order. Throw in the abundance of merchandising and licensing revenues (“Limited Edition” Star Wars Cheez-Its, for the love of Yoda!) and it’s a no-brainer. In Return of the Jedi, the ultimate Death Star was destroyed. Darth Vader was vanquished and Anakin Skywalker was able to revert to the Light Side. Luke made peace with his father, Obi-Wan and Yoda. But the 32 years that have lapsed between Episode VI and Episode VII have not been entirely kind. In fact, things are pretty much a mess again all over the galaxy. Following peace comes unrest and after the Sith and the Empire now comes the First Order. What was once referred to as the Rebellion is now the Resistance and it’s time once again for good to take a stand against evil. It’s a time for vigilance in the midst of a First Order that commits genocide and obliterates innocent villages. It kind of sounds like Earth. Today. In a galaxy very, very nearby. In the thick of things is a new heavy, Kylo Ren (Adam Driver, Inside Llewyn Davis). He’s a villain with a really bad temper and a tortured soul; his power over the Dark Side of the Force is awesome, but imperfect. Kylo is anxious to vanquish the last of the Jedi and fulfill Darth Vader’s ambitions. George Lucas credited Joseph Campbell and his scholarly works on mythology as a source of inspiration for the Star Wars saga, a creation of Lucas’ imagination after he was denied rights to the Flash Gordon universe. Here, the mythology continues. Rey thought Luke Skywalker (Mark Hamill), Han, the Jedi and the Force were merely elements of mythology. She’s proven wrong. In a big way. There’s a cool element of King Arthur and Excalibur effortlessly thrown into the action of Episode VII and the family themes that came to a crescendo in Return of the Jedi are further amplified. Rey is waiting for her family to return to Jakku. Finn was torn away from his family and has no idea who they are. And even Han, Luke and Leia — they all have family troubles of one form or another. Those who think the dysfunction of TV’s Empire (not to be confused with Darth’s Empire) is shocking (and entertaining) should revisit the Skywalker clan. Dynasty, Dallas, whatever. They’ve got nothin’ on these family matters. This adventure goes to some surprisingly dark places of the mind and it’s great to see the saga regain some of the edge it toyed with in The Empire Strikes Back (co-written by Kasdan and Lucas). But the movie also sports plenty of good humor, including a new classic from Han, “You changed your hair.” See it to appreciate it. At its core, the Star Wars saga has always been about the humans and overcoming the seemingly insurmountable. Those roots have proven fertile ground for material that inspires across generations — and with Episode VII, the appeal of this refreshed mythology is likely to grow.